In a recent study, Ashok Kumar, Ph.D., associate professor of neuroscience, Thomas Foster, Ph.D., Evelyn F. McKnight Chair for Research on Cognitive Aging and Memory, and collaborators explored the relationship between brain inflammation, long-term potentiation and aging. Increasing levels of oxidative stress as we age are known to lead to cognitive decline. This stress is thought to negatively affect the function of specific brain receptors called N-methyl-D-aspartate, or NMDA, receptors, which contributes to psychiatric diseases and impaired brain function associated with old age. Aging is associated with low-level increases in markers of inflammation, and this rise in systemic inflammation is thought to contribute to age-related diseases and cognitive impairment. Anti-inflammatory drugs can help with age-related cognitive deficits and improve impairments in synaptic plasticity, a process important for learning and memory that requires healthy NMDA receptors. However, it is not known if anti-inflammatory drugs can combat the decline in NMDA receptor function caused by oxidative stress. Our results demonstrate that oral treatment with an anti-inflammatory drug, indomethacin, improved synaptic plasticity and age-related performance on a memory task. In addition, indomethacin treatment increased the NMDA receptor component important for brain cell communication and reversed NMDA receptor dysfunction caused by oxidative stress. 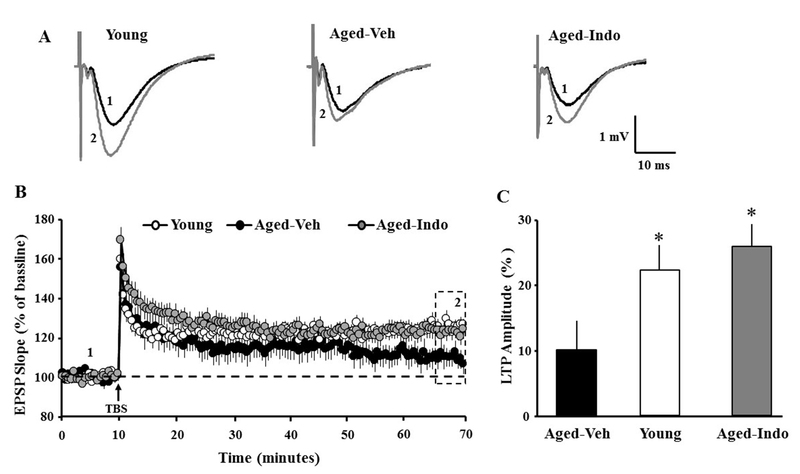 View the published manuscript in Neurobiology of Aging. Learn more about Research Snapshots.